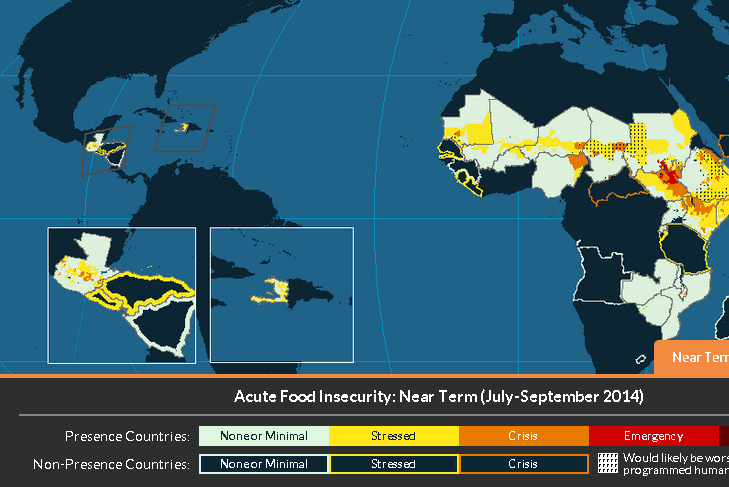 The Famine Early Warning System Network (FEWS NET) website serves as a portal for food security knowledge management, as well as famine monitoring and warning. It houses critical qualitative and quantitative data, reports, and analyses from key stakeholders including USAID’s Office of Food for Peace, NASA, NOAA, USDA, USGS, food security experts, donor organizations, governments, and NGOs. FEWS NET monitors, assesses, and predicts the impact of environmental and socio-economic hazards and conditions on food security and famine. The site allows USAID to expand the access of critical information on famine and food security issues and to push messages to target audiences. It promotes rapid decision making and information sharing among stakeholders, policymakers, governments, and humanitarian organizations. OSC redesigned the FEWS NET website, ensuring maximum functionality by integrating social media, user feedback, and input. The redesign uses data visualization and mapping to help create a knowledge hub for food security and related research. OSC delivers strategic communications support and trains FEWS NET staff and local partners. With OSC’s guidance and web development support, these website enhancements and capacity building efforts have improved FEWS NET stakeholder capacity, utilizing best communication practices to better monitor, assess, predict, and inform about the impact of environmental and socio-economic conditions, and their present or future impacts on food security and vulnerability around the world. After having completed a site usability analysis of the exiting FEWS NET web site, OSC’s technical redesign included the migration of the website back-end to an open-sourced Drupal-based solution to maintain the expandability and year-to-year improved value of the website, while cutting costs associated with a proprietary platform. As a multi-stakeholder and global technology platform, OSC’s complete front-end re-design optimized the website’s usability and functionality with an emphasis on advanced data visualization techniques and mapping. Social media integration and user feedback technologies were included to improve analysis and decision support while ensuring the integration of gender disaggregated data and analysis. OSC’s technical enhancements to the website allow it to push messages to specific target audiences through e-newsletters, email/SMS notifications, RSS feeds, and social media posts to support rapid information sharing. OSC provides the on-going, day-to-day technical support and management of the site. OSC manages project communications for FEWS NET, providing strategic communications support on the design and production of all written, visual, and oral communications products. OSC provides researched-based recommendations to improve FEWS NET’s efforts and to strengthen the ability of the project’s staff to appropriately tailor messaging to specific contexts and audiences. This includes recommendations to local and regional partners for FEWS NET monthly country and regional food security outlook updates, alerts, monthly price watches, and monthly food assistance outlook briefs. In an effort to strengthen the communications capacity across FEWS NET project offices, OSC designs, prepares, and delivers training workshops for FEWS NET headquarters, field staff, and partners throughout Kenya, Tanzania, Niger, Burkina Faso, Senegal, and Guatemala. These workshops focus on strategic communications to increase the visibility of the FEWS NET project and web platform and to increase awareness of FEWS NET issues. Important skill areas include effective presentations, crisis communications, relationship-building, stakeholder relations and engagement, external positioning, and media outreach.